← I won’t serve on a board without D&O insurance! Ever get bad advice? Sure. We all have in our past. Ever take that advice without question because the person giving it was an investor, a superior in rank, the chairperson of your board? I’ll bet you have at least one story of bad advice taken and being bitten as a result. As one illustration among many I can recall, let me tell you the story of the first investment made by a newly organized formal group of angel investors. Some of you can guess that name of the group. It was thrilling for these angels to find a young entrepreneur with an idea for a business that seemed so destined for greatness that the angels invested over $1 million on the condition that the group receive two board seats and one observer seat on the start-up’s board. The young, eager entrepreneur immediately agreed, and the business was launched, well- funded and anticipating great profits. As the business expanded into a second city and then planned expansion into a third, there was a rift that became evident between these angel board members, played out in front of the CEO. The angels argued about whether the expansion was too quick, requiring additional money, or should be slower and bootstrapped with profits from the first city’s success. Finally agreeing upon expansion at speed, the angels raised more money and encouraged the CEO to accelerate the expansion, which the CEO did with enthusiasm. It did not take long for the company to again run out of money, and for the board to split over the next moves (since the first city continued to be profitable). [Email readers, continue here…] The angel investors could not raise the next, larger round to finance the shortfall and further expansion, putting the fragile young company at risk for following the advice of its board. In the end, the company had to turn to a wealthy individual investor who took control of the corporation as his price for saving the company. Look ahead only a short time, and the new major shareholder ran into trouble overleveraged with his real estate investments and defaulted on his funding promises. But I digress. Painfully. Had the angel board members been able to agree upon a financeable strategy for growth, the company might have been immensely successful. To put an ending to this story, the entrepreneur followed the suggestions of the new investor just as he had followed the angels, and accelerated quickly into more cities, again running out of cash. And now you know that the wealthy investor in the meantime, could not make good on his promise to further fund the company, which found itself unable to meet its obligations and ultimately was shut down, causing a complete loss for all. Bad advice taken by an enthusiastic and compliant young CEO was the root of the cause, compounded by circumstance. By not putting up any argument and being completely compliant, the CEO ceded control of the company to outsiders who gave bad advice. The lesson for any CEO or for any of us for that matter is to filter all advice through the strainer of good reason, taking that which seems reasonable and rejecting that which is wrong for ourselves or for the immediate time. And, as I have learned from experience, if you perceive advice to be in error or against better judgement, form your arguments after a little thought and make your case with information to back it up if necessary. Most of the time, the person on the other side of the table will see your side, feel your passion, and either agree or withdraw any objection. Remember, passion and reason almost always win the day in these cases, even when facing a superior in the food chain. This entry was posted in Depending upon others, Protecting the business, Surrounding yourself with talent. Bookmark the permalink. 3 Responses to Any advice can be worthless, or worse. 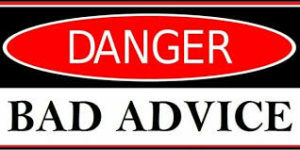 How do you distinguish between “advice” and “direction?” In my experience, board members expect the CEO and other C-levels to follow their directions (they consider that their prerogative since they’re called “directors”) or else they’ll find a CEO who will take direction from them. The CEO may resist and stand his/her ground, but even if successful, that may not be enough for directors who expect their directions to be followed. Whatever you call it, bad advice or bad direction can certainly accelerate the demise of a company. Is it really as black and white as laid out here? The decision to go big with more money or grow organically is always a very difficult one. In this case experienced Angels had different points of view. The CEO was “young and eager” (implying inexperience) and expanded “with enthusiasm”. How was he to know this was not going to work? What basis did the CEO have to even take a position? Quality of execution is just as important as the strategy chosen. What about all of the other variables to success? The quality of the people in the second city for example? Changes in the macro economic environment? Was this 2007 to 2011? Given the almost infinite number of variables in Angel deals isn’t it risky to take specific examples where there is disagreement and make generalizations or second guess? Why didnt the CEO cut expenses and use his retained earnings to keep the company afloat? I have been in a similar situation when loosing significant clients/revenue and know how difficult that is but if you are passionate and believe in the model in order to survive their is no other solution.